In the Spring of 1889, just as he was about to break ground on his own country house in Washington, Connecticut, the architect Ehrick Rossiter discovered that the wooded hillsides in his dramatic view to the west were slated for clear cutting. For him, there was only one thing to do. For him, there was only one thing to do. Using the construction money for the house, he bought the threatened land from the timber company and saved forever the 100 acres that now form the heart of the Steep Rock reservation. During his 36 years of ownership, Rossiter built carriage roads and small river crossings and invited his friends and fellow townspeople to enjoy the wild beauty of this section of the Shepaug River Valley. 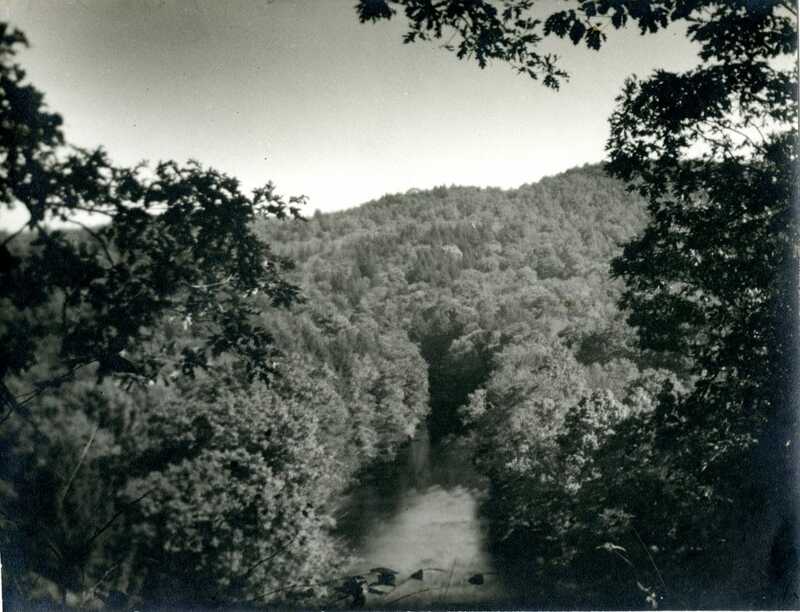 In 1925 Rossiter donated the land, which included the Steep Rock overlook, to a carefully chosen group of trustees, thus ensuring its preservation. Four years later the trustees purchased the area known as the Clam Shell, and in doing so preserved the view from Steep Rock. With little of the fanfare that sometimes surrounds such efforts today, these ten people quietly established a public land trust long before the idea of land protection became common. Since then, many landowners have given additional tracts to the Steep Rock Association, and today Steep Rock’s holdings include over 2,700 acres. Ehrick Rossiter graduates from The Gunnery, where he develops a fondness for Washington and roaming along the Shepaug River. A 235-foot curved tunnel is blasted through bedrock to make way for the planned railroad. begins operation, putting Washington Depot (then known as the Hollow) within a day’s travel of New York City. Carrying both passengers and freight, the railroad runs along the river. Ehrick Rossiter buys 100 wooded acres along the Shepaug River to save it from logging. Rossiter donates the land, called “Steep Rock,” to a group of trustees, so that it be preserved. The nine original trustees are Adrian Van Sinderen, George W. Vaillant, Hamilton Gibson, Arthur L. Shipman, Arthur C. Titus, Victor H. McCutcheon, E. Winthrop Rossiter, H. Siddons Mowbray and Anne Van Ingen. Ehrick Rossiter, born in 1854, distinguished architect and founder of Steep Rock, dies. Shepaug Valley Railroad ceases operation and tracks are removed. The trustees invite 81 Steep Rock contributors to a picnic at the Clam Shell. Subsequent picnics include the whole town. Great Flood wipes out parts of the Depot and bridges and abutments along the Shepaug River. Boulders, uprooted trees and tons and tons of debris litter the river banks. Steep Rock is formally incorporated as a land trust, with 18 trustees serving three-year terms. The Steep Rock reservation has increased to about 650 acres. The Washington Horse Show is held in the newly built riding ring in a meadow below the former Holiday House. During its tenure, the show donated its profits to Steep Rock. Jean and Adrian Van Sinderen donate 650 acres, now called Hidden Valley, to the Steep Rock Association. After intense debate, trustees accept a non-contiguous piece of land on Church Hill, expanding Steep Rock’s role in preserving land throughout Washington. A small wooden footbridge over Bee Brook allows dry access to the Hidden Valley entrance just north of the Rt. 47 highway bridge. Hidden Valley footbridge is built across the Shepaug River, forming a pleasant loop trail. Built by (then) forester John Marsh and Michael Alex. The McDonald family donates a conservation easement — Steep Rock’s first — of land on Lower Church Hill. Trustees hire first director, shared with the Roxbury Land Trust. New Hidden Valley footbridge replaces the 1977 one. Hauser footbridge, a wood and cable suspension bridge, is built in the Steep Rock reservation across the river just downstream of the old sawmill hole. A parcel of 238 acres known as Meeker Swamp is purchased with roughly equal contributions from the Town, State and Steep Rock and its supporters, and dedicated as the Macricostas Preserve in July 2001. Macricostas Preserve is officially opened, with bridges, boardwalks, and marked trails in place. Heavy rains in October cause flooding, and sweep away the bridge in Hidden Valley. In December, Vinnie Forese retires as forester after 25 years. New Hidden Valley footbridge, replacing the 1987 one washed away in 2005 flooding, is dedicated to the memory of Stephen C. Reich on New Year’s Day. Steve Law became the new Executive Director of Steep Rock Association replacing Susan Branson who retired after 20 years of service. Bronson Farmland, 68.9 acres of prime farmland and forest adjacent to Hidden Valley Preserve, is acquired. Steep Rock Association (SRA) launches a two-year critical habitat study on all SRA property. Educational programs are offered for the first time to the general public in the summer edition of The Steep Rock Vista newsletter. Your donation today helps Steep Rock Association protect and steward special places for you to learn about nature and explore the great outdoors.